Ground Level, ocean front condo with expansive views of the Pacific Ocean and the neighboring islands, Lanai and Molokai. This 1 bedroom , 1 bathroom offers you a home away from home. The master bedroom offers a queen size bed and the kitchen is fully equipped and opens up to the living area offering a large open living space. 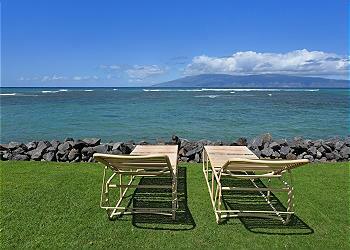 `Relax on your lanai listening to the beautiful sound of the ocean. Kahana Reef offers a seaside pool and BBQ, where you can enjoy the ocean breeze. With laundry facilities on property and free parking. **CONSTRUCTION SPECIAL! ** HUGE DISCOUNTS! If you book during this time you are accepting the Construction Work that will be going on and there will not be any additional discounts.